Please see the updated captive-bred marine fish species list for 2017! 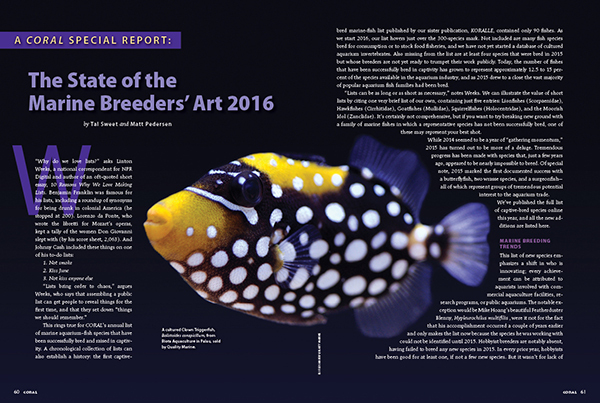 CORAL Magazine’s Annual Report on the state of marine aquarium breeder efforts, with cultured Clown Trigger being sold by Quality Marine and raised by Biota Marine, Palau. Image: Eli Fleishauer. CORAL Magazine’s Annual Listing of captive-bred marine aquarium fish species, current through early December 2015 – an excerpt from the January/February 2016 issue of CORAL Magazine – subscribe today! 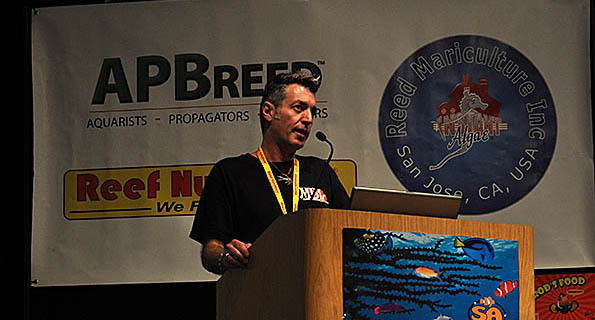 Author Tal Sweet speaking at a Marine Breeding Initiative Workshop. Image: Matt Pedersen. This rings true for CORAL’s annual list of marine aquarium–fish species that have been successfully bred and raised in captivity. A chronological collection of lists can also establish a history: the first captive-bred marine-fish list published by our sister publication, KORALLE, contained only 90 fishes. As we start 2016, our list hovers just over the 300-species mark. Not included are many fish species bred for consumption or to stock food fisheries, and we have not yet started a database of cultured aquarium invertebrates. Also missing from the list are at least four species that were bred in 2015 but whose breeders are not yet ready to trumpet their work publicly. Today, the number of fishes that have been successfully bred in captivity has grown to represent approximately 12.5 to 15 percent of the species available in the aquarium industry, and as 2015 drew to a close the vast majority of popular aquarium fish families had been bred. “Lists can be as long or as short as necessary,” notes Weeks. 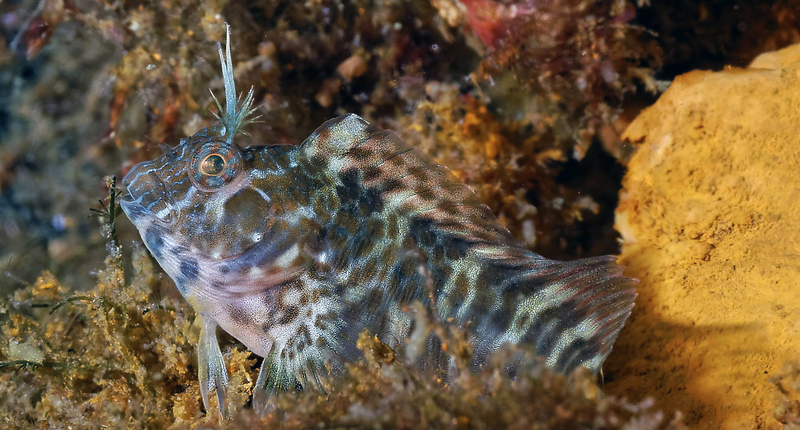 We can illustrate the value of short lists by citing one very brief list of our own, containing just five entries: Lionfishes (Scorpaenidae), Hawkfishes (Cirrhitidae), Goatfishes (Mullidae), Squirrelfishes (Holocentridae), and the Moorish Idol (Zanclidae). It’s certainly not comprehensive, but if you want to try breaking new ground with a family of marine fishes in which a representative species has not been successfully bred, one of these may represent your best shot. While 2014 seemed to be a year of “gathering momentum,” 2015 has turned out to be more of a deluge. Tremendous progress has been made with species that, just a few years ago, appeared to be nearly impossible to breed. Of special note, 2015 marked the first documented success with a butterflyfish, two wrasse species, and a surgeonfish (tang) — all of which represent groups of tremendous potential interest to the aquarium trade. We’ve published the full list of captive-bred species online this year, and all the new additions are listed here. This list of new species emphasizes a shift in who is innovating; every achievement can be attributed to aquarists involved with commercial aquaculture facilities, research programs, or public aquariums. The notable exception would be Mike Hoang’s beautiful Featherduster Blenny, Hypleurochilus multifilis, were it not for the fact that his accomplishment occurred a couple of years earlier and only makes the list now because the species he was working with could not be identified until 2015. Hobbyist breeders are notably absent, having failed to breed any new species in 2015. In every prior year, hobbyists have been good for at least one, if not a few new species. But it wasn’t for lack of trying: When the Marine Breeding Initiative hosted its sixth annual MBI Workshop in 2015, it was attended by over 70 individuals from around North America. The MBI continues to lead the way in sharing captive breeding information with aquarists all over the world. Some breeders elected to reexamine and refine species that, while not “new” to the captivebred list, had long been forgotten. Proaquatix wowed aquarists by making captive-bred Jackknife Fish, Equetus lanceolatus, commercially available. This species was first cultured decades ago, but hadn’t been revisited and has never been available to the public as a captive-bred offering. In addition to reviving past species, Tami Weiss of FusedJaw.com helped uncover and verify several species of seahorse and pipefish that have been successfully cultivated around the world in years past, but have never been included on our lists until now (you can see these species listed on the online master list). Tom Bowling and Biota Marine of Palau led the charge of commercial producers, claiming success with nine new species never before seen as captive-bred fishes. Among the many new genera they reared, arguably the most attention-grabbing was the Clown Triggerfish (Balistoides conspicillum). Breeding this prized species in captivity is a dream that has haunted commercial breeders for decades. More importantly, although it was not the first captive-bred triggerfish ever, the Clown Trigger was the first to be supplied on a commercial scale (by Quality Marine) in the United States. 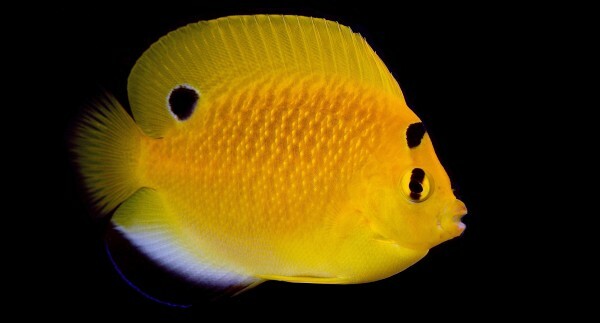 Bali Aquarich upped their angelfish game by adding three more new species to their list this year; they are currently the world’s leading supplier of captive-bred marine angelfishes. Bali also delighted the aquarium audience with the production of two unique large angelfish hybrids. The first, a hybrid between the Flagfin and Goldflake Angelfishes (Apolemichthys trimaculatus X A. xanthopunctatus) has been dubbed the “Faux Gold”; so far we’ve only been shown juveniles, which are mainly yellow in coloration. Outwardly more unique, the accidental hybrid of the Emperor and Annularis Angelfishes (Pomacanthus imperator X P. annularis) turned heads and, upon maturity, displayed a unique blending of traits from both parental species. Commercial breeders based in the US have had a few successes of their own: Oceans, Reefs and Aquariums (ORA) is now producing the unusually small-for-its-genus and reef-safe Radial Filefish, Areichthys radiatus (see Rarities excerpt), as well as the Transparent Cave Goby, Fusigobius pallidus, and they surprised us with three other new accomplishments they’d not shared previously (see list, below). 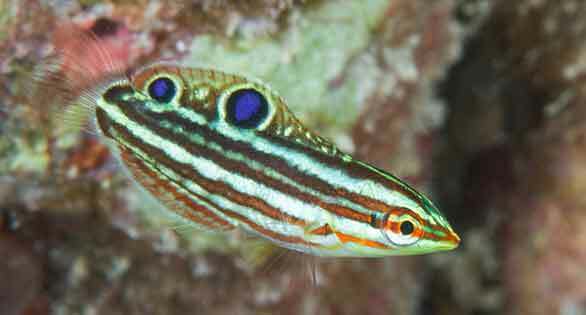 Hawaiian Christmas Wrasse, popular aquarium fish bred for the first time by Frank Baensch. Frank Baensch, known for his work at Reef Culture Technologies as one of the world’s pioneering angelfish breeders, finally broke the butterflyfish barrier with captive- bred Chaetodon kleinii. Although Baensch and Rising Tide had a few “near misses” in the preceding years, it was truly only a matter of persistence and time until the work paid off. Wrasses featured prominently this year; in the past Bali Aquarich accidentally reared several of the Cleaner Wrasse, Labroides dimidiatus, the first aquarium-size captive-bred wrasse, but that was it for a while. Two more wrasses were cultured this year: Baensch bred Halichoeres ornatissimus and Kevin Barden became the first to breed the Melanurus Wrasse, Halichoeres melanurus. Barden’s work with the Rising Tide Conservation program at the Tropical Aquaculture Laboratory in Florida highlights the growing success of institutional and academic research in the field of marine ornamental aquaculture. Featherduster Blenny from the Gulf of Mexico, successfully bred by hobbyist Michael Hoang. Image: JIm Garin. As for public aquariums, Noel Heinsohn of the Long Island Aquarium became the first person to successfully raise the beautiful Lyretail Anthias, Pseudanthias squamipinnis. This was the first reported success within the Anthiinae subfamily. One of the accomplishments that slipped under the public radar is the breeding of the Longspined Porcupinefish, Diodon holocanthus, at the Pittsburgh Zoo & PPG Aquarium. Jennifer Dancico and Josie Romasco share joint responsibility for this accomplishment, which was supported by a grant from the Institute of Museum and Library Services (IMLS) that funded larval fish workshops hosted by the New England Aquarium and Roger Williams University. Additionally, Monika Schmuck reports successes at the New England Aquarium rearing both the Planehead Filefish, Stephanolepis hispidus, and the Dusky Pipefish, Syngnathus floridae, using techniques from these workshops. Several other successes have occurred as a result of these workshops, and we hope to highlight them as soon as we are given permission to do so. Progress was made in New Zealand, as well: Kelley Tarlton of the Sea Life Aquarium in Auckland announced the first success with the rare Spiny Seadragon, Solegnathus spinosissimus. Not only is Sea Life the first institution to put adults on display, but the Aquarium is also raising offspring. 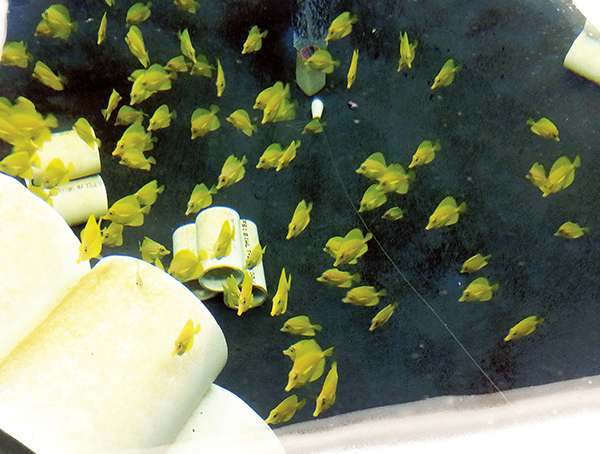 World’s first captive-bred surgeonfishes: Juvenile Yellow Tangs by the hundreds at Hawaii’s Oceanic Institute. Image: Chad Callan/OI Rising Tide. All in all, it is astonishing to see the major strides that were taken and the boundaries that were crossed during the past year, but it is vital to know there is a bigger picture. While captive breeding is a high priority for the hobby and the trade, it must be coupled with regulated, sustainable wild fisheries in order for both to remain viable and diverse. Weeks, Linton. 2009. 10 Reasons Why We Love Making Lists. Get the full report in print, including more stunning images as a CORAL Magazine subscriber. Don’t miss out, subscribe today! Orange Common Name = new to the list this year. Green = Commonly Available. Easy to find as a captive-bred fish, often from more than one source, throughout 2015 and/or into 2016. Blue – Moderate to Low. Might have taken some searching, and availability may have been limited, but was reasonably obtainable as a captive-bred fish in 2015. Purple = Scarce. Generally only one source or breeder is known, and potentially only a handful of specimens may have been available. You may have “had to know someone” or even know the breeder directly in order to obtain them as captive-bred fish during 2015. Black = None. The authors and consulted parties were unaware of any retail availability of this species from a captive-bred source during 2015.